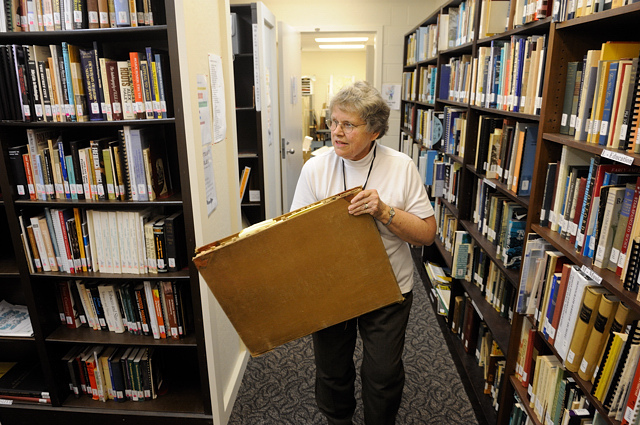 Tucked away in the basement of the Greenbelt Public Library in the old town of Greenbelt on 11 Crescent Avenue, is a single room packed to the brim with historical information within the collections of the Frederick S. DeMarr Library of County History. It was here, among the many shelves of old documents, books, maps, newspapers, and local community pamphlets that I went looking for and found a good portion of Forestville, Prince George’s County, Maryland’s early beginnings. As I read the pamphlet from cover to cover (all 5 pages) and saw the names and history associated with streets, subdivisions, schools, and properties I knew (yes, the Entwistle’s and the Randall’s and Forestville Volunteer Fire Department…), that I must share the history of this census designated place where I spent many of my earlier years. And, what would my genealogical documentation be without the history of the community where I grew up? So below, is the nearly 40-year-old digitized pamphlet that unfortunately includes no preparers’ names other than the Forestville Citizen’s Association. I hope you find it as enjoyable as I did. FYI, where I could find them, I added drawings, maps, and pictures, as appropriate. I also added some further descriptors in brackets “[ ]”. Secondly, [in 1959 and 1960], Pennsylvania Avenue was extended east out of D.C. to Meadows as a controlled access four-lane divided highway and designated MD 4. Marlboro Pike was assigned MD 4 Business, a designation that was gone by 1970. By 1970, the MD 4 freeway between Meadows and Hills Bridge in Waysons Corner was complete. Third and last, the building of the Capital Beltway [1957-1964]. The extension of Pennsylvania Avenue brought a tremendous increase in resident population and the Beltway brought a tremendous increase in commercial development ending, perhaps forever, the small-town atmosphere of Forestville. Little is known to us of the time when Forestville was first recognized as a community. We do know of the history of one important early institution–namely, the Prince George’s County Alms House. In 1768, the MD General Assembly passed the “Act for the Relief of the Poor” authorizing the construction of Alms Houses in several counties. Most Alms House residents were people deemed insane, disabled due to loss of limb or sight or people just considered to be “outcasts of society” during this period in history. John F. Beall, acting as “Trustee of the Poor,” purchased 30 acres from Nathaniel Magruder for the Alms House. This land was part of the original 1761 land grant known as “Black Oak Thicket.” The original building was constructed in 1771 on D’Arcy Road, formerly known as Alms House Rd. It fell into ruin by 1860, and a second building was constructed on the same site and finished in 1870 (pictured). Alms Houses became obsolete over time, mostly from government programs such as Roosevelt’s “New Deal” and Johnson’s “Great Society.” The PG County Alms House closed in 1965, and was torn down in the 1970’s. It was located on the current location of the PG County Department of Public Works on D’Arcy Rd. Prior to and for some time beyond the Revolutionary War (1764-1789), activities of greater significance occurred in the communities that grew close to the principal means of transportation which was by boat on the many navigable tributaries of the Chesapeake Bay. However, for a short span of several days, this area was the scene of much activity and excitement because of the invading British troops who encamped in the vicinity and marched up Marlboro Pike on their way to burn the Capitol of the United States during the War of 1812. We have no record of the emotional reaction of the residents of the area to those events but it takes little imagination to visualize what those emotions were. We were at war with a much superior enemy and his well-trained and battle seasoned troops were passing through our community. Undoubtedly, the residents of the area figured the worst in the form of alleging burning of homes, arrests, and other abuses. Recollections of the persons and their activities that help create or assume are digested from stories told to us by respected senior citizens, Mrs. Norman Collins and Mrs. Edna Entwistle. Their stories augment the story of Forestville as told by Mr. Willard Entwistle in his line picture story at our March flag raising. Have you ever noticed a large red brick building on D’Arcy Road, amid the public works buildings? It is the remaining part of what was the Alms House Project. It is more than 200 years old. This project was founded on December 23, 1771 when the trustees of the poor for Prince George’s County purchased the land as follows: 157 pounds 10 shillings current money paid in hand for 90 acres of land called the Black Oak Thickett and 50 pounds current money paid in hand for 10 acres of land called the second addition to OFFUTS Adventure. The two deeds were recorded on February 22, 1772. This 100 acres of land was formerly owned by a gentleman named Nathaniel Magruder who was given the land by Lord Baltimore as a patent on January 7, 1761. On the law books of Prince George’s County, there were 14 articles which cover the running of this project and apparently it was used for various purposes besides being a home for the poor. One such use was a place to house vagrants where they were to be kept at hard labor. Possibly their hard labor was to work the acreage as there were tobacco barns, cornfields, a large orchard, and other farm operations. The story is told that the money from fruit sales (especially pears) was used later to put in the electricity and water system without any cost to the county. Of the various stories that have been told, one was that British troops killed in the attack on Washington were buried there. It is known that persons that died in the Alms House and others who had no burial ground were interred in the cemetery that used to be there. But, no evidence has been found that British soldiers are buried there. Up until about 1951, a single lane dirt road called Almshouse Road went through the woods and over a little white bridge up the hill to the property. There was no other entrance. In later years the place became solely a rest home for the indigent poor and the name was changed to “County Rest Home”. There were many old folks who spent their declining years there in peace and security. It was a pleasant place to live. The old folks would sit outside in good weather and watched the turkeys, chickens, ducks, cats, dogs, and even the pigs and cows, or look over their neatly kept vegetable garden. The complex could care for 35 persons and it was for all races, colors and creeds. Citizen organizations, churches, and school children went there to entertain the inhabitants. The history of the Alms House has been compiled into two volumes that are available at the Courthouse in Upper Marlboro, Maryland. Also known as The Alms House of Prince George’s County, Maryland. This was a County Financed Program. The caring for the County’s destitute dated back to 1768. The original Alms House was constructed in 1772, and its successor built approximately 100 years later on the same site. Both structures have long since faded into obscurity, leaving no current landmark(s) to reflect the exact site of the County’s Program. The physical location of the Alms House [8401 D’Arcy Road] was noted to be in front of the cemetery, (notes describe the cemetery as being located in an open field directly to the rear of the Alms House). Of the 143 interments, only one single grave marker remains at the site of The Alms House, where those listed were buried. Petitioners were voted and acted upon by the Executive Committee, comprising of the Trustees of The Alms House. Residents consisted of indigents, paupers, the disabled and any other citizens of Prince George’s County with no visible means of financial income or support. 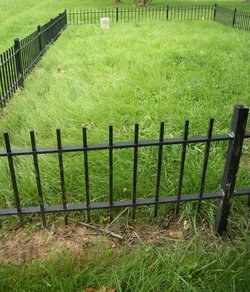 Paupers (with previous ties to Prince George’s County), who died in neighboring jurisdictions were also buried here. Major George Peter wrote to Colonel J. S. Williams, May 24, 1854, who was then writing his book on the invasion and capture of Washington, as follows: “I was ordered back to join the concentration of the army at Long Old Fields (Forestville). 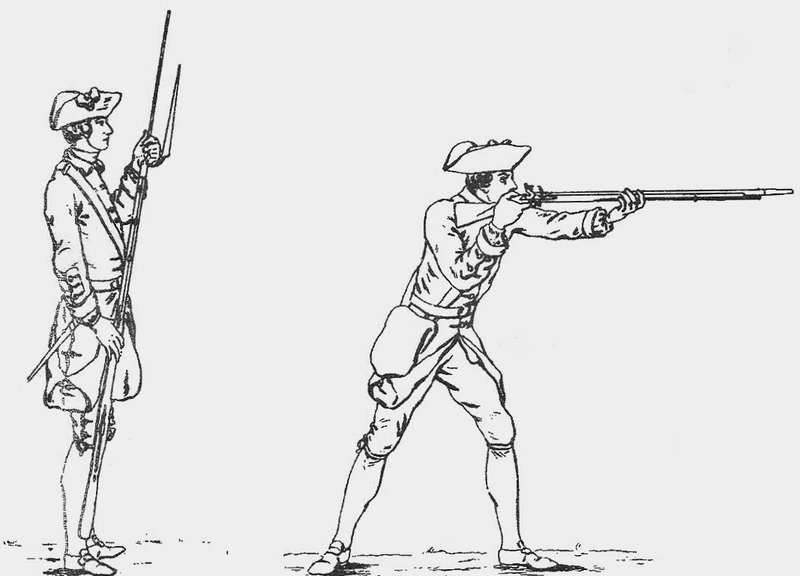 During the nights of August 22 and August 23, there was the constant alarm of guns being fired by sentinels, always the result of an army comprised of raw militia. On my arrival at Long Old Fields, I found Smith’s brigade and the flotilla men under Commodore Barney with a battery of two 18 pounders and the Marines under Colonel Miller. General Ross (British) occupied Centerville having arrived there at 2 PM August 23. He (General Ross) sent back to Marlboro and dragged up with his sailors, two or three pieces of light artillery the only guns he had with him at Bladensburg. 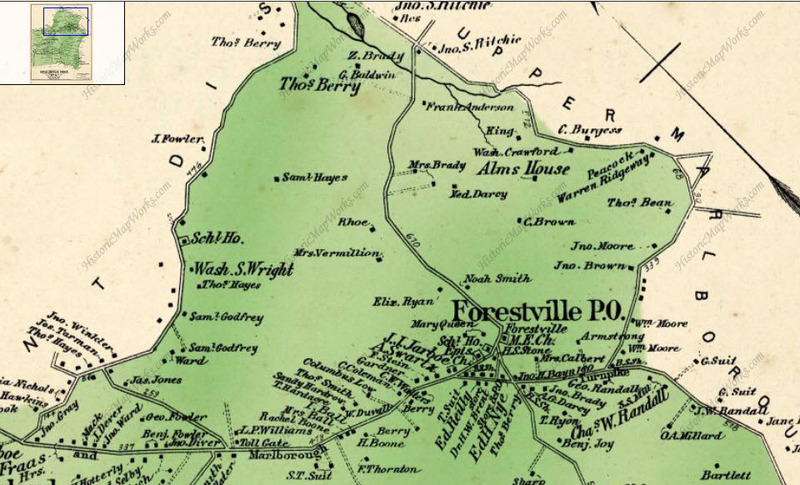 Before the Civil War, a large part of what is now Forestville, was owned by David and Lowenia Sommers and was known first as Magruder’s Plains, later as Long Old Field and then as Ole Long Fields, changed to Forestville in the 1870s. The Marlboro Turnpike or Old Stage Road ran through it from Washington to Upper Marlboro, with two toll gates at the main entrance to District Heights and at Marlboro Pike and Forestville Road. Before the Battle of Bladensburg, troops marching overland from Hills Bridge and Benedict and camped at Ole Longfields. 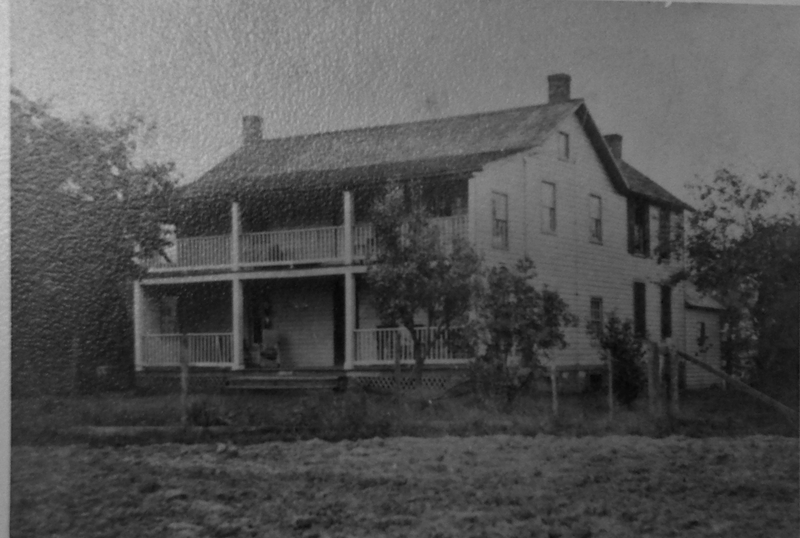 In or about 1869, a Mr. Nye, from Pennsylvania bought a large piece of Mr. Magruder’s Plains and built a large home and a store for groceries, dry goods, and general merchandise. A part of the store became the First Post Office in or about 1874. This was the only post office between Washington DC and Marlboro. Each morning the mail carrier met the Popes Creek train line at Marlboro and took off the bag of mail for delivery. This post office was on the north corner of Forestville Road and Marlboro Pike where the Sunoco station is now [the Sunoco station still remains there in operation]. Next to the post office on Marlboro Pike was Dr. Brent who had his office, and up the road on the opposite side, was a Mr. Rielly’s store which served for many years as a polling place. Across Marlboro Pike from the post office were two stores and a residence (where Mitchell’s gas station is now). The ground for the First Methodist Church was bought in 1820, 4/5’s of an acre from Mr. Marshall – price $50. This is the fourth church on this site with additional land being bought over the years. The Episcopal Church cornerstone was laid in 1865. Its educational building/rectory etc. were added later. Noah Smith, a local preacher from England, bought a plot of ground after the Civil War from the Sommers tract and built what is now Phelps Addition to Forestville. 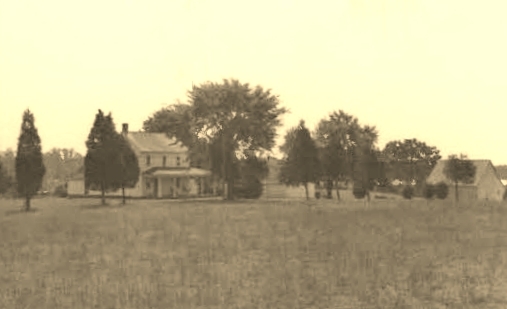 J. W. Randall and wife from New York bought from the Sommers tract a parcel known as Grey Eagle and built his home just down Marlboro Turnpike from where one of his sons Charles and his wife built their home and a large lumber or saw and grist mill in 1854, which served the Forestville and surrounding country for many years. This is the site of the Forestville Fire Department [still an active Volunteer Fire Company]. The Forestville School situated between the Methodist and Episcopal churches was opened by Alonzo D’Arcy who taught there, 1866 to 1883–10 months a year to about 50 pupils– cost of each approximately $18 per year. The school building is now occupied by a surveyor [W. L. Meekins]. Since 1900 we have seen four elementary and junior high schools in Forestville. In the early 1800s Phillip Spaulding, a large landowner in Old Long Field, kept a tavern and stagecoach inn on the present site of the Regency Nursing Home [7420 Marlboro Pike]. This was later used as a polling place and when our election district was formed, Spaulding District, was the first. Our junior high in Forest Manor bears his name. At Marlboro Pike and Westphalia Road, W. L. Moore operated a blacksmith and wheelwright shop on what was known as Kalverton Edge Tract. On the north east side of Westphalia Road extending toward the post office was land owned by the Armstrong’s who gave the ground for the present Methodist Parsonage in 1882. John Henry Bayne (born on my birthdate January 5, in 1840) was the wheelwright and blacksmith at the intersection of Marlboro Pike and Ritchie Road (7700 Marlboro Pike)– owned and occupied for decades now by Freddie’s Liquors. Wheelwrights like John were very important tradesman in small rural towns like Forestville. They made wheels for wagons, carriages, and riding chairs. Because the roads were rocky and rugged, wheels had to be made to handle these rough conditions. He also built or repaired carts, wheelbarrows and wagons so local farmers could transport stock or take their crops or milk to market. In April, 1868, John Bayne married Amelia Louise Moore from Westphalia Road. Amelia died as young mother at age 27 leaving John a widower with four children. He next married Mary Ellen Rebecca Darcy and they had nine children together. John died on December 23, 1921, at the age of 81. Forestville’s native, John Bayne, never left Forestville. In fact, he and his two wives are buried at Epiphany Episcopal Church Cemetery, 3111 Ritchie Road–the same church I attended as a child and where I was married in 1965. Later on there was another blacksmith, Mr. Proctor, who had a home and shop on land owned by Dr. John Sansbury who had his home and office just west of the present location of the Regency Nursing Home. This same Dr. Sansbury had a racetrack in 1908 on what is now Sansbury Subdivision. That track was the first in Prince George’s County, a trotting track, one half mile long. Dr. Sansbury’s residence and office later and was owned by J. H. Boyd, M. D.
In the 1880s, part of the Pike, across from where Penn Mar is now [2950 Donnell Drive], was a shoe repair shop (Keiler’s). In those days, and up to about 20 years ago , the site of the Penn Mar shopping center was a part of O’Donnell’s farm and the present Donnell Drive was a dirt road that went back to the farmhouse. The house was somewhat to the north of the present Pennsylvania Avenue Extended. Pennsylvania Avenue Extended did not exist then. In the 1880s farther up the Pike toward District Heights was Jackson Memorial Methodist Church, public school, and cemetery. Next up was the first Catholic Church in Forestville, a frame church painted white built in 1912. It was replaced by the present Mount Calvary church, school, and convent. McNamara high school for boys was built later [converted to a coed school in 1992 when neighboring La Reine Catholic High School for girls closed its doors in Suitland]. Across the Pike, in what is now Berkshire, they drilled for oil in the 1900s with no luck. They also drilled on the Matthews tract which is now Andrews Air Force Base. “Wells have been dug near Lonaconing in Western Maryland; in the Triassic soil of Frederick County; in Prince George’s County; near Leonardtown, and on the Isle of Wight near Ocean City,” reported The Sunday Sun Magazine in the 1940s. “In 1919, the only real “strike” came in Prince George’s County, when an operating well produced a bucketful of oil every 24 hours. Abundance wasn’t in the cards, and shortly afterward, the well and its so-called pure oil went dry. However, the talk of Maryland oil wouldn’t go away, as speculators continued to whip up interest. “The kind of science the big companies employ is not to be believed. … Hardly a single geologic condition is favorable for the accumulation of oil near Washington. The usual requisites for an oil pool are lacking, and no reputable geologist would advise the expenditure of money under these conditions,” said a 1920 report from the U.S. Geological Survey published in The Sun at the time. I loved reading about the history of Forestville. My family has a long history in the village and I am trying to learn as much about it as I can. My GGG grandfather, Edward S. Wohlfarth purchased property and a house from William C Cornell in 1897, who purchased it from Alonzo Darcy in 1890. Unfortunately, the deeds do not have survey information, so I’m not certain where the property was located. Rumor has it, though, that the house was once used as the Toll Gate as early as 1840. It was later sold out of the family in 1961 and burned down by the fire department some time later. I was looking at the map that is in the blog post and I see the Toll Gate annotated. Would you be able to tell me what map that is and where I could find a full sized version of it? I’m particularly interested in the bit that is cut off just south of that toll gate. Thank you so much for the wonderful information and history lesson! Does anyone know who Sansbury Road was named after? Here’s my quick and dirty research: Upper Marlborough’s Town was established in 1706, 10 years after the county was formed. There were three notables in Prince George’s County in the 1800’s with the surname “Sansbury”. Father, John M. Sansbury (born 1792 in Maryland), and sons, Richard H. Sansbury and Francis O. Sansbury. They were farmers. The 1850 Census shows this family living in the Spaulding District. 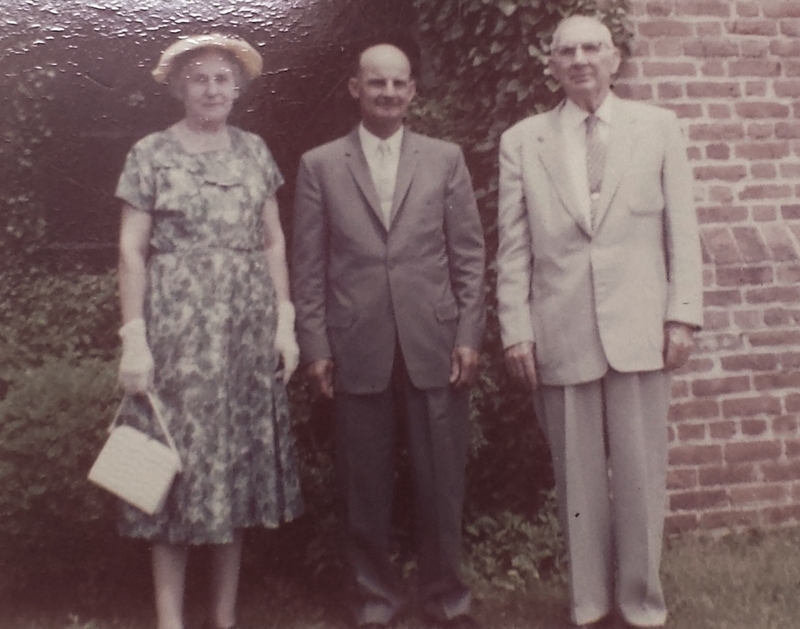 Sometime between the 1850 and 1960 Censuses, they moved to Bladensburg. There is a historic Sansbury-Griffith House at 8000 Croom Station Road, Upper Marlboro. The Sansbury-Griffith House appears on the 1878 Hopkins Map but not on Martenet’s 1861 Map of Prince George’s County. The dwelling first appears on the 1878 Hopkins Map, the farmhouse was constructed c. 1875. Richard H. Sansbury and his father John M. Sansbury purchase the property in 1871 from Samuel B. Hance. Richard H. Sansbury was born about 1835 and John M. Sansbury in 1792; Both men were farmers and probably attracted to the property due to its proximity to the rail line and Croom Station. Constructed on a 100-acre parcel, the Sansbury-Griffith House illustrates the transition from large plantations to smaller farms that occurred throughout Prince George’s County after the Civil War. John M. Sansbury died in 1874, leaving his one-half interest in the 100-acre property to his other son, Francis O. Sansbury. So I suggest that these are the Sansburys from which the road’s name was derived. Others out there who care to comment? I replied last week here. More news this week. JOHN M SANSBURY was actually one of the founding fathers of the Forestville Volunteer Fire Dept in the 1930,s. In fact, he was its first Fire Chief. His son JOHN ROGER SANSBURY, who was also active in the fire dept passed away two days ago. His obituary and services arrangements can be viewed on Lee FUneral Home in Owings, Md. Enjoyed reading the information on Forestville. My family was originally from Suitland and I lived there from 1954-1963. My grandfather Benjamin Walls owned a store which later became the Lamp Post Inn. Walls Lane is named for our family and my home stood where the apartments were built on Walls Lane. The land originally came into my family from my grandmothers Minto side of the family. I believe the original tract of land they owned was about a 1000 acres that extended from Walls Lane down to Morningside and beyond to the Henson Branch. The Minto family came to the area in the early 1880’s, I believe a couple of their homes are still standing overlooking Suitland Parkway today. The are all buried at Eppithany in Forestville as it was there place of worship. I can relate to many of the places in Forestville you mention, my grandparents and father attended Eppithany Church and were christened there, my first hair cut was at Alberts Barber Shop, and I knew the Entwisle’s family and remember their block company well as my dad was a brick mason and we used to always purchase materials from them. I was wondering if you have any information on my family names in the area around Suitalnd and Forestville? Albert was also my dad’s and husband’s barber from when he was a child until we moved away from the Forestville area in 1992. My dad continued with Albert as his barber until he had a debilitating stroke and passed away not too many years later. We now drive dad many miles to his newest “hairdresser,”–she’s a redhead and he loves her! I attended Epiphany Episcopal church, too. And, as a teenager headed up the teen youth group for at least one year. We used to play games in and around the graveyard; and, I was married there by long time pastor, Reverend Benjamin Ridgeley in 1965. I believe I know the two houses you reference that sit atop the Suitland Parkway Overpass. In fact, one of my classmates from high school briefly rented one of them when she first married. Finally, there are 7 members of the Minto Family buried in Epiphany Church’s Churchyard. Use this link to findagrave.com, then click on any of the names listed there and you will be taken to their memorial pages, with as many details as have been provided: https://findagrave.com/cgi-bin/fg.cgi?page=gsr&GSiman=1&GScid=80935&GSfn=&GSln=Minto Hope this helps. Thanks so very much for commenting and allowing me to go back down memory lane once again. Ms. Joanne Dickinson: A very enjoyable and educational read thanks to your dedication. Is there any data or information available pertaining to the 1940’s? I’m very interested in learning more about the development and everyday life of Forestville after purchase and development of Federal Center. 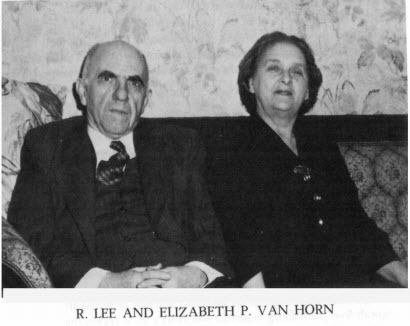 (1940’s -1960’s particularly) Can you suggest another Forestville, MD website that offers this information? Photos? In preparation for the Census Bureau’s Bicentennial Celebration in 2002 I helped research and build the Census Bureau’s Bicentennial Site, which later, we incorporated into the overall census.gov site that is still active. Go to this link: https://www.census.gov/history/ and browse the various horizontal and vertical tab links. You will find some history of the area, how the Suitland Parkway was built so government workers could more easily travel between DC and Maryland; the old airport–the grounds on which the Census Bureau was originally built, some info about the dairy farms/farmers, the “Suit” family, from which the name Suitland came, but they lived in Forestville. Hopefully a lot o the info we collected and published hasn’t been truncated. My husband is Chief of the Forestville Volunteer Fire Department. A few years back I started capturing it’s history (https://bobdi23.wordpress.com/fvfd-history/) which includes local geographic and people histories. You are welcome to browse these pages (titled by decades) for more info. E.G., here’s the page link on the 1930’s: http://wp.me/P2UW6s-3c; 1940’s: http://wp.me/P2UW6s-3e 1950’s: http://wp.me/P2UW6s-3g 1960’s: http://wp.me/P2UW6s-3i 1970’s: http://wp.me/P2UW6s-3k 1980’s: http://wp.me/P2UW6s-3n – and it goes into the millennium years. There’s also St. Pius X, Knights of Columbus on Stewart Road in Forestville, MD, and many of the local churches that would have developed their own histories of the area–especially Mt. Calvary Catholic Church on Marlboro Pike. I posted an article on Mt. Calvary’s/Forestville’s history on this Facebook page: “Mt. Calvary Catholic School Alumni-Forestville, MD,” too. I also visited the Prince George’s County Historical Society in Greenbelt, MD within the Frederick S. DeMarr Library to get some of my resources. I believe they are only open on Saturdays, or you can call for a private appointment. My husband as a young teenager and adult lived next door to Arthur and Marie Suit, who also were you were members of the forestville/Suitland family. They lived on 3709 4th Avenue which was renamed 82 ND Avenue and in the 1970’s again renamed “Newkirk” Avenue. This was about the time PG County built a new elementary school at the end of Newkirk. It was named ‘Longfield’ Elementary. The name dates back to Forestville’s earlier name “Longfields”. Do you have any info on the “Old Ham House” located near Greenbelt? 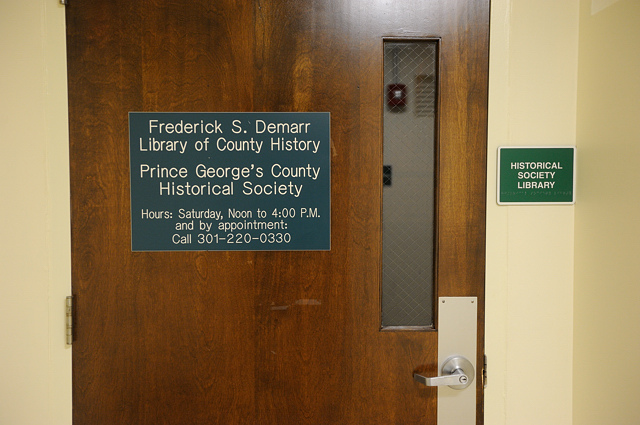 You might want to check with the Frederick S. DeMarr Library of Prince George’s County History located in the Greenbelt, MD library at 11 Crescent Avenue. Phone: 301-220-0330 or email: info@pghistory.org. Another property acquired for the Suitland Federal Center was the former dairy farm and summer home of the Carry Family, located between the present locations of gates one and two, on Suitland Road. Arthur Carry emigrated from Germany in the late 1880s and established the National Capital Brewing Company, located at 14th and D Streets, S.E. The National Capital Brewing Company was associated with several other local breweries that produced National Bohemian Beer, which would become more closely associated with Baltimore, Maryland, in the post-WWII years. When Prohibition closed the brewery, Carry switched to the manufacture of ice cream, which he sold under the name “Carry’s Special” to the B&O Railroad for their dining cars. The company later became part of the Meadowgold Ice Cream Company. In 1923, the Carry Ice Cream Co. was also one of the first companies in the country to sell individual servings of ice cream in a 5-oz. container–a new marketing concept introduced by the Dixie Cup Company of Easton, MD. The Carry Home served as an office and community center for government housing that was built on the property in about 1943. It burned to the ground in 1960. The Suitland Manor apartments, directly across Suitland Road from the Federal Center, were built in 1942 in anticipation of an influx of federal workers. Parkway Terrace, off Silver Hill Road at Suitland Parkway was built five years later. Many Census Bureau employees lived in these developments and others in the community, such as Whitehall Square and Marlborough House, and walked to work. Yes. Before retiring I actually helped research and create the Census Bureau’s history website. Thanks for your comment. Are there any more photos of the Carry House and the Government housing project for which the Carry House provided ofices? We lived in the project in the early 50’s. You might want to check with the Frederick S. DeMarr Library of Prince George’s County History located in the Greenbelt, MD. The library is at 11 Crescent Avenue. Phone: 301-220-0330 or email: info@pghistory.org. You might also check with Library of Congress Photo Collections. The Catholic girls high school in Suitland which merged with McNamara High School, Forestville, in the 1990′s was called La Reine High School. It is now a PG county middle school. I am a graduate of La Reine.